Schwechat (German pronunciation: [ˈʃvɛçaːt]) is a town southeast of Vienna known for the Vienna International Airport and Schwechater beer. The city is home to the refineries of the Austrian national oil company OMV. Schwechat is named after the river Schwechat, which flows through the centre of town. The city subdivisions called Katastralgemeinde (Cadastre) are Kledering, Mannswörth, Rannersdorf and Schwechat. Home to the settlement Ala Nova of the Roman Empire, the city was first mentioned in a document in 1334. The meeting at Schwechat of Emperor Leopold I with Jan Sobieski in 1683, after the liberation of Vienna, is commemorated by an obelisk. The imperial troops defeated the Hungarian insurgents in a battle fought here in October 1848. In 1724, a textile factory was established in Schwechat. Schwechat profited massively from the Austrian industrialisation wave of the 19th century, many of the companies established then still existing today (like the famous Dreher Brewery, founded in 1796 by Franz Anton Dreher the Younger). Schwechat became a city in 1924 and was incorporated into Vienna in 1938. The city's oil refinery was a bombing target of the Allied Oil Campaign of World War II, with the southern aviation plant complex of the Heinkel firm (Germany-based at Rostock-Schmarl as Heinkel-Nord, the Schwechat offices/facility was called Heinkel-Süd) also targeted in late 1943 and lasting through the spring of 1944. Schwechat became an independent city in 1954. Since 2017 it belongs to Bruck an der Leitha District because Wien-Umgebung was dissolved at the end of 2016. Vienna International Airport, the headquarters of Austrian Airlines, and the headquarters of LaudaMotion are in the city of Schwechat. When Lauda Air was an independent airline, it had its corporate headquarters in Schwechat. Niki was also based in Schwechat. Schwechat (as Megacity Schwechat) plays an important role in the Austrian sci-fi movie Die Gstettensaga: The Rise of Echsenfriedl. ^ One or more of the preceding sentences incorporates text from a publication now in the public domain: Chisholm, Hugh, ed. (1911). "Schwechat" . Encyclopædia Britannica. 24 (11th ed.). Cambridge University Press. p. 391. 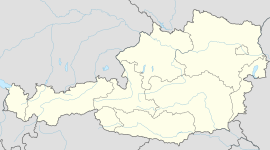 ^ "Offices in Austria". Austrian Airlines. Retrieved 26 May 2009. ^ "Information about the city plan." City of Schwechat. Retrieved on 5 September 2009. ^ "Imprint." LaudaMotion GmbH. Retrieved on April 2, 2018. "LaudaMotion GmbH Concorde Business Park 2/F/10 A-2320 Schwechat"
^ "World Airline Directory". Flight International. 27 March – 2 April 1991. Retrieved 3 February 2013. ^ "About Us Contact". Niki. Archived from the original on 16 October 2009. Retrieved 2 September 2009. ^ "Schule." Schwechat. Retrieved on September 4, 2017. Wikimedia Commons has media related to Schwechat. This page was last edited on 26 March 2019, at 15:26 (UTC).